NourSat is back on 10949.00MHz, pol.V SR:27500 FEC:3/4 SID:7402 after a break ( PID:5101/5111 English - Clear). NourSat is back on 10815.08MHz, pol.H SR:27485 FEC:5/6 SID:54 after a break ( PID:852/1108 - Clear). New frequency for NourSat: 10955.00MHz, pol.H (DVB-S2 SR:2400 FEC:2/3 SID:1 PID:49[MPEG-4]/52 Arabic- Clear). A new channel has started in DVB-S Clear: NourSat (Lebanon) on 11014.00MHz, pol.H SR:28500 FEC:5/6 SID:55 PID:5510/5520 Arabic. New frequency for NourSat: 12734.00MHz, pol.H (DVB-S2 SR:2170 FEC:2/3 SID:3 PID:49[MPEG-4]/52 Arabic- Clear). NourSat switched to Eutelsat 7 West A satellite at 11355.00MHz, pol.V (DVB-S , 11355.00MHz, pol.V SR:27500 FEC:3/4 PID:1702/1703 English). NourSat switched to DVB-S2 at 11163.50MHz, pol.H SR:2170 FEC:2/3 PID:49[MPEG-4]/52 Arabic. NourSat switched to Eutelsat 10A satellite at 11163.50MHz, pol.H (DVB-S , 11163.50MHz, pol.H SR:2308 FEC:3/4 PID:33/36 Arabic). NourSat switched to Hot Bird 13C satellite at 10949.00MHz, pol.V (DVB-S , 10949.00MHz, pol.V SR:27500 FEC:3/4 PID:5101/5111 Arabic). NourSat (Lebanon) broadcasts in DVB-S Clear on 11163.50MHz, pol.H SR:2308 FEC:3/4 SID:2 PID:33/36 Arabic. NourSat (Lebanon) broadcasts in DVB-S Clear on 10873.00MHz, pol.V SR:27500 FEC:3/4 SID:9330 PID:58/59. A new channel has started in DVB-S Clear: NourSat (Lebanon) on 12562.00MHz, pol.H SR:26657 FEC:1/2 SID:16 PID:278/534 Arabic. New PID for NourSat: PID:33/36 Arabic,37 SID:2 (11163.50MHz, pol.H SR:2170 FEC:3/4 - Clear). A new channel has started in DVB-S Clear: NourSat (Lebanon) on 11163.00MHz, pol.H SR:2170 FEC:3/4 SID:2 PID:3601/3604 Arabic. New SID for NourSat on 12698.00MHz, pol.H FEC:3/4 SR:2169: SID:2 ( PID:3601/3604 Arabic - Clear). New SID for NourSat on 10949.00MHz, pol.V FEC:3/4 SR:27500: SID:7402 ( PID:5101/5111 - Clear). New SID for NourSat on 10949.00MHz, pol.V FEC:3/4 SR:27500: SID:0 ( PID:5101/5111 - Clear). New PID for NourSat: PID:3601/3604 Arabic SID:1 (12698.00MHz, pol.H SR:2169 FEC:3/4 - Clear). A new channel has started in DVB-S Clear: NourSat (Lebanon) on 12698.00MHz, pol.H SR:2169 FEC:3/4 SID:2 PID:33/36 Arabic. NourSat is testing in DVB-S Clear on 10949.00MHz, pol.V SR:27500 FEC:3/4 SID:7402 PID:5101/5111. 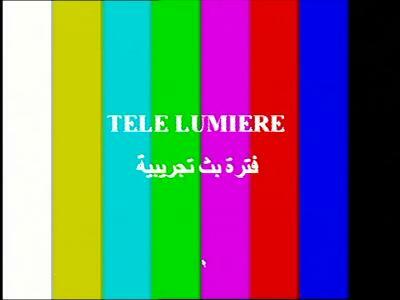 A testcard identified NourSat has started in Clear on 10949.00MHz, pol.V SR:27500 FEC:3/4 SID:7402 PID:5101/5111.